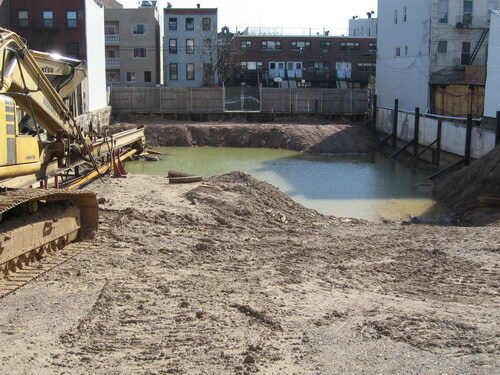 The Gowanus Lounge: GL Construction Site Du Jour Update: Surf's Up at Urban Green! GL Construction Site Du Jour Update: Surf's Up at Urban Green! What is interesting about Urban Green on N. 6th Street isn't the advertising pitch, but the fact you can now go swimming in the huge open pit that one can reach through the large opening that is consistently left in the fence. We note that the site has a Porta-Potty in case you really need to go and don't feel like going on the street and that, since the Nor'easter, it also has a huge, deep pool of water. 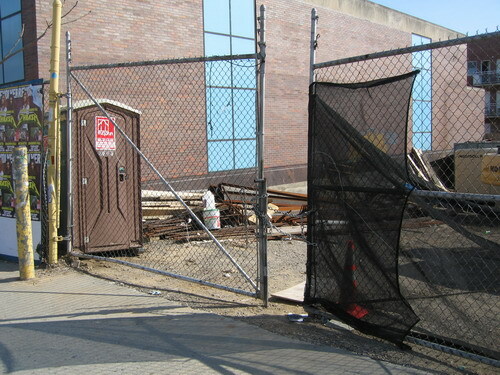 It's great to know that leaving your construction site open to the public is perfectly legal, at least, in Brooklyn. Urban Green Death, people. Surf's up. Coney #2: Thor Now Trying the Velvet Hammer?